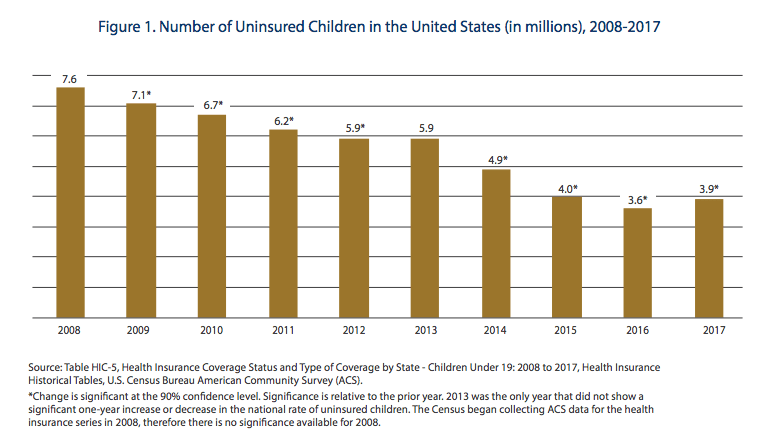 good people at the Georgetown University Health Policy Institute Center for Children and Families are out with some sobering news on the health coverage provided to children in the U.S. Three-quarters of the children who lost coverage between 2016 and 2017 live in states that have not expanded Medicaid coverage to parents and other low-income adults. The uninsured rates for children increased at almost triple the rate in non-expansion states than in states that have expanded Medicaid. The share of children without health insurance nationally increased from 4.7 percent in 2016 to 5 percent in 2017. Nine states experienced statistically significant increases in their rate of uninsured children (SD, UT, TX, GA, SC, FL, OH, TN, MA). Texas has the largest share of children without health coverage with more than one in five uninsured children in the U.S. residing in the state. In 2017, the number of uninsured kids in North Carolina climbed to 120,000 and the failure to expand Medicaid is almost certainly to blame. The bottom line: After years of progress, America is losing ground in the battle to provide health coverage to its children and it seems almost certain that conservative, anti-government policy choices are to blame. Click here to read the full report.